As I did in my little demo of how camera format (sensor size) affects depth of field, I will keep certain factors constant and attempt to show the effect of just one variable - focal length of the lens. Although once again I am going about this from the standpoint of a photographer who wants to create a certain image with whatever tools are at hand, in this instance I am assuming that I have a principal subject that I want to have occupying a certain proportion of my frame, even if this requires moving my camera position. 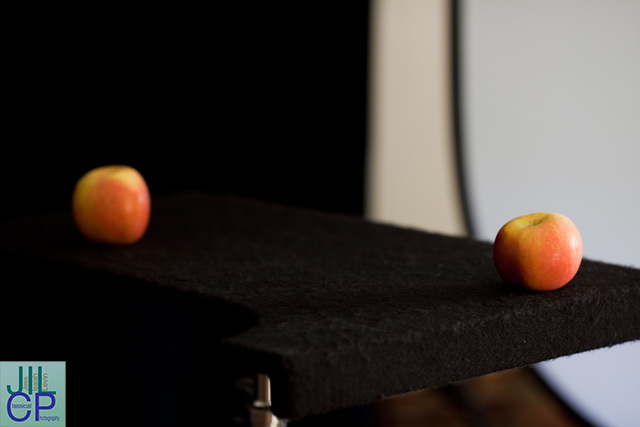 So, the camera will be moved, but the subjects - two apples - remain "glued" in place on the table. 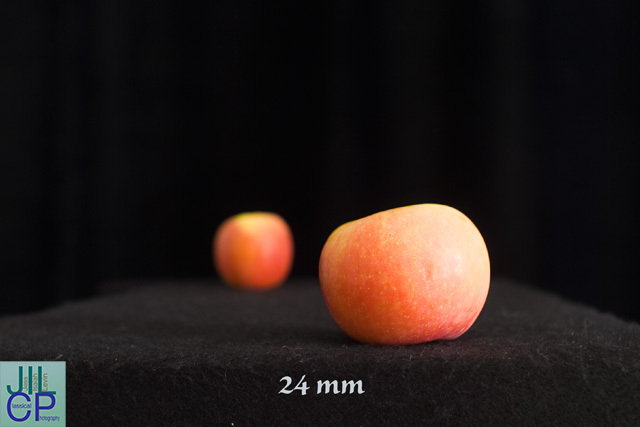 Each lens is focused carefully on the nearest surface of the closer apple. Each is shot at an aperture of f/2.8. Same camera for each. I used a view screen grid to make the "big apple" (the one closer to the camera) the same size in each photo. 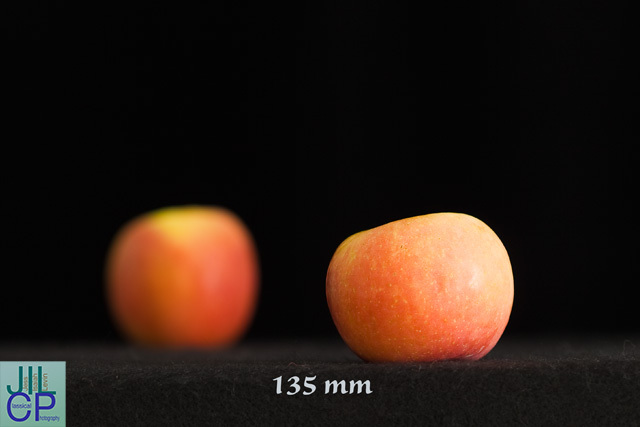 Then I cropped each image by precisely the same amount so that we could easily see the effect on the apples. Viewing the uncropped images at 100% (one computer monitor pixel for each camera pixel) shows the same results, but you would be waiting a long time to download full-sized images. I used these four lenses: a 15 mm fisheye, a 24 mm, a 50 mm, and a 135 mm. First is an uncropped (but greatly downsized) image of the full frame as captured by the 15 mm. 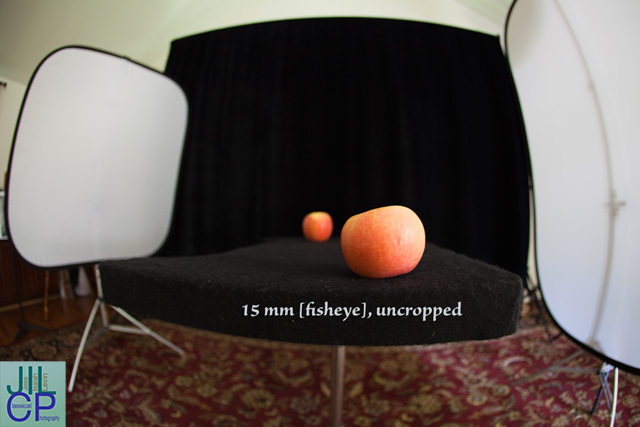 The apple is less than a foot from the plane of the camera sensor, and only a few inches from the front of the lens. Here is the cropped version of the 15 mm shot. [Actually, I reshot it to refine the exposure, as I was using window light and it was changing subtly.] Notice that the rear apple is nicely blurred, and looks farther away than it really is, because there are no other objects to give a sense of space and we (i.e. the camera and lens) are very close to the main subject. Next I switched to a 24 mm lens. I moved the camera position away, following the direction of the lens axis to keep the view of the subject the same. When the subject size was exactly the same, I shot and then cropped exactly the same degree as before. Note that the second apple now looks larger. We're further away from both, so the proportional effect of the distance between the two is lessened. 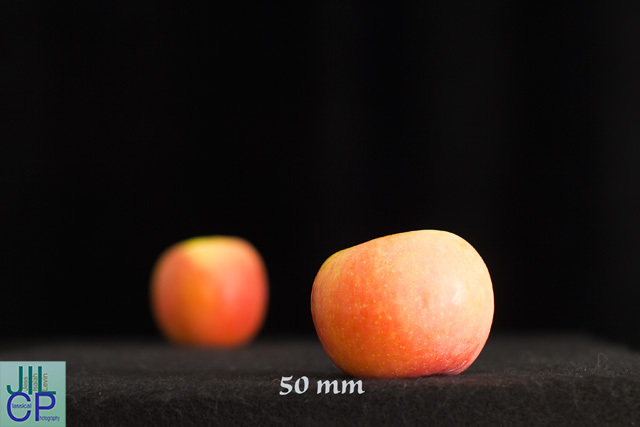 If you look carefully, you'll see slight changes in how far around the "horizon line" of the first apple we can see. The second apple is blurred to the same degree as before, but it's larger so it seems closer and the effect of the blur may seem accentuated. Now we move to a 50 mm, and roughly double our subject distance compared to the 24 mm shot. 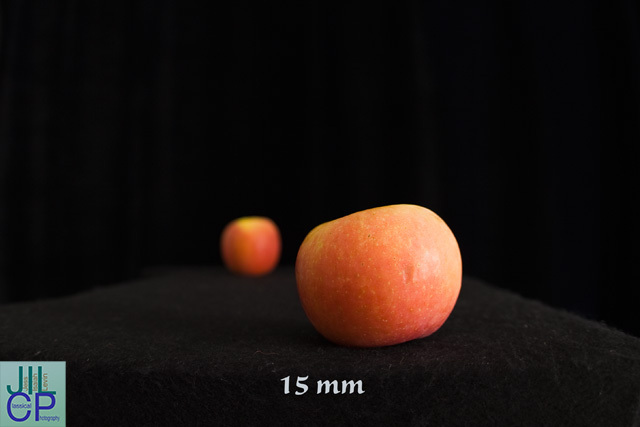 The same effects are there, even more apparent when you compare the 15 mm directly to the 50 mm. Finally, here is a shot with a 135 mm lens. The camera has moved back enough that perspective is starting to look "compressed". The two apples seem not very far apart. The second one is, though, still blurred by the same amount. This is one of the reasons that telephoto lenses are often used to isolate a subject, yet keep it connected with a soft rendition of its surroundings. Remember, all of these shots were done at an aperture of f/2.8. While I've got the 135 on the camera, here is a shot from a different angle, which gives a good representation of the actual distance between the apples, which were not touched until all the shots were made. After that, one of them got eaten. If you do a portrait with a wide angle lens inches from someone's nose, you may get enough magnification to yield shallow depth of field and separate them from the background. However, faces are not rendered attractively from that perspective! Lenses of different focal lengths (which for any given camera equates to different fields of view, narrow or wide angles of coverage) naturally lead us to shoot from different distances. However, even if we are trying to be imaginative and looking for different perspectives, we will usually find that we want to be within a certain distance range from our subject. That means that changing the lens focal length will change the magnification. That's why telephoto lenses are usually associated with shallow depth of field. We tend to use them in ways that result in more subject magnification than shorter lenses give in the same situation. If you can't get closer to a bird or an athlete, a long lens increases the magnification. Aperture and magnification are what you need to keep in mind if you want to control depth of field.